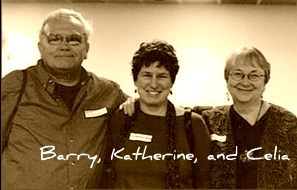 In 1984, Barry Dickson, a social worker and storyteller who worked with a large caseload of families experiencing barriers to bonding, and Joan Bodger, a therapist and storyteller, planned a pilot project that would serve families identified as “at risk” by the Toronto Children’s Aid Society, a child protection agency. The Mother Goose Enrichment Program was based on Barry’s experiments using rhymes and stories with the children in his care and on Joan’s experience in the New York City Head Start Program and her deep conviction of the value of using rhymes and stories orally with children and adults. Celia Lottridge and Katherine Grier, both storytellers and educators, taught in the program with Joan. The idea was to begin at the beginning with the relationship between parent and baby or young child, and to use the pleasure and power of rhymes, songs and stories taught and experienced orally in a group setting to nurture the parent-child relationship and to foster family wellness. When the pilot project was over, Katherine Grier approached Celia Lottridge and said that the program needed to be continued. Celia agreed, and together, Katherine and Celia sought funding to bring the program to families in the general community. In 1986, the Parent-Child Mother Goose Program (P-CMGP) offered one group for parents and infants in the Lakeshore area of Etobicoke, Ontario. That first program was followed by others in different neighbourhoods, and before long, parents with an aptitude for the program were being trained as program teachers through apprenticeship training. While outreach remained concentrated on families most in need, the program was open to all. This shift towards serving families with differing degrees and kinds of needs proved beneficial, as parents became resources and models for one another. As the children grew, the need for a program for two-to-four-year-olds became clear, and a second level of the P-CMGP, in which parents learned stories to tell to their children, was developed and added to the program. In the mid-nineties, teacher training workshops were developed to train individuals and organizations in the philosophy and methods of the program. As a result, the P-CMGP has spread across Canada and beyond, and many different kinds of organizations and agencies now offer the program to the families they serve – among them: community centres, community health centres, neighbourhood houses, public housing units, library outreach programs, family resource centres, family service agencies, reservations, Aboriginal friendship centres, teen parent centres, and immigrant and refugee support centres.